October 1, 2016 (La Mesa)-- Crowds thronged the streets of La Mesa last night for the opening of Oktoberfest , savoring an array of international foods, Bavarian beer, root beer, arts and crafts vendors, and dancing the night away in the beer garden to the strains of a German band. October 1, 2016 (La Mesa) - This year's Oktoberfest in La Mesa was packed! There were tons of people enjoying all the street vendors. August 19, 2016 (La Mesa) - You're invited to the largest Oktoberfest celebration west of the Mississippi: La Mesa Oktoberfest from September 30 to October 2, 2016. The free event is spread out over nearly six blocks in La Mesa Village and features hundreds of exhibitors, family friendly activities, German food, music, dancing, outfits, games and of course, beer. November 5, 2015 (La Mesa) – A packed crowd turned out at Johnny B’s restaurant in La Mesa last month for a mixer hosted by La Mesa Conversations. Mayor Mark Arapostathis spoke on Oktoberfest, which this year was scaled back to two days with fewer vendors but more emphasis on the festival’s German roots. This Oktoberfest was run by the La Mesa Village Merchants Association, without the Chamber of Commerce. The Mayor addressed how Oktoberfest has changed through the years, reminiscing about past festivals and how the changes have impacted the community and local merchants. A representantative from the merchants' group also have a preview of upcoming events including Christmas in the Village, a grand reopening of the downtown streets and the centennial legacy project unveiling. October 7, 2015 (La Mesa)—La Mesa’s annual Oktoberfest took place last weekend, on a smaller sale than in the past but with a renewed emphasis on the festival’s roots: German food, beer and music. July 14, 2015 (La Mesa) – The La Mesa Chamber of Commerce has partnered with Grossmont Center and the Cushman family, to submit a Special Events application to the City for a beer garden event October 16 – 17. Describing it as “family-friendly,” the application proposes live music, 4-5 food vendors and 3-4 sponsor tables, to be held in the parking area where Hooley Fest has been held in the past. September 22, 2014 (La Mesa)--The La Mesa Oktoberfest is one of East County’s biggest street festivals, drawing 200,000 people every year. This year’s Oktoberfest will be held October 3-5 in the heart of La Mesa’s downtown village on La Mesa Boulevard between 4th Avenue and Acadia. The event, sponsored by the La Mesa Chamber of Commerce and the La Mesa Village Merchants Association, began as a small street fair over 35 years ago. Now the three-day bash features over 250 vendors, food including German bratwurst and a beer garden, kids’ activities and entertainment ranging from German music to classic rock and roll. 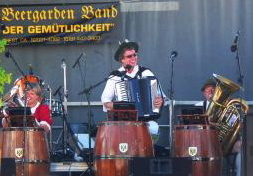 September 11, 2013 (La Mesa) - Soon the sounds of polka music, as well as rock and roll, will be heard throughout the downtown area of La Mesa, as the 40th Annual Oktoberfest kicks off October 4-6. Barbecues will be heating up for bratwurst and kegs in the Chamber's "big beer garden" during downtown La Mesa's popular fall tradition. Thousands of people come to La Mesa during this three-day event to enjoy German-style food, live music and vendor booths. The La Mesa Chamber hosts its "family-friendly" beer garden sponsored by Sycuan Casino, located on Allison Street between Pine and Palm Streets, where you can hear live music all weekend, enjoy games for the entire family and sit while eating "the best food this side of the Mississippi," says Chamber president Mary England. October 5, 2012 (La Mesa) – Oktoberfest has been a tradition in La Mesa for 35 years, growing from a small street fair to a three-day fest that now draws over 186,000 attendees and 400 vendors. La Mesa Chamber has partnered with La Mesa Village Merchants Association, founders of the event. This year’s festivities include not only such German favorites as bratwurst, beer, and a Raving Polka band, but also more contemporary favorites such as CarTune Dogs playing classic rock and Jumpin’ Jack Flash mobile music all weekend long. September 28, 2010 (La Mesa) -- The City of La Mesa, the La Mesa Chamber of Commerce and the La Mesa Village Merchants’ Association invite you to La Mesa's annual Oktoberfest celebration in the downtown Village October 1-3. This year's event will feature 400 vendors, two beer gardens, live music, carnival rides, and an estimated 200,000 visitors. October 7, 2009 (La Mesa) – The big beer garden filled to capacity on Friday and Saturday night, when party-goers from around San Diego County gathered in downtown La Mesa to celebrate La Mesa’s Oktoberfest. Entertainment ranged from polka dancing to a rock-and-roll band, plus perennial favorites such as the beer stein hoisting contest (photo, left). La Mesa Police estimate that more than 200,000 people flocked to the three-day event. September 30,2009 (La Mesa) – Friday, Saturday and Sunday, more than 200,000 people are expected to flock to downtown La Mesa for one of East County’s biggest annual celebrations: La Mesa 36th Annual Oktoberfest. This year, watch for some new attractions—and the return of an old favorite. By popular demand, the big beer garden is back—along with traditional German foods and music including a Bavarian band the Gemutlichkeit Dancers. But there are also some changes—including Sunday afternoon rock and roll music by the Heroes, one of San Diego’s most popular rock groups, plus new food options ranging from shaved ice to hamburgers. September 14, 2009 (La Mesa) -- You're invited to join a few friends--200,000 or so--in the biggest Oktoberfest celebration in the Western United States. Festivities extend through six blocks in the La Mesa Village area of downtown La Mesa, featuring three beer gardens and more than 300 vendors.